Container ship with Indian crew catches fire off Agatti Isle in Lakshadweep, four missing - Integration Through Media ....! 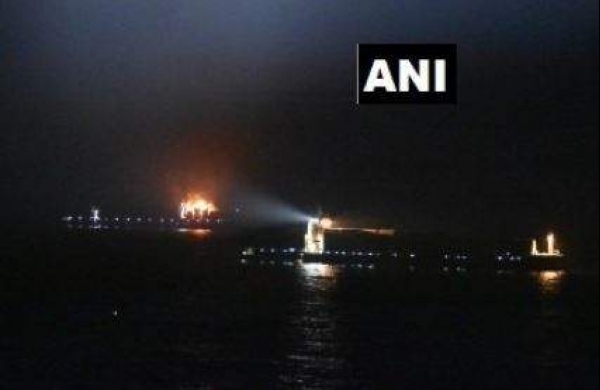 MUMBAI: An explosion followed by a massive fire ripped through a container ship with several Indian crew on board, off the Agatti Islands, an Indian Coast Guard official said here on Wednesday. Four crewmen are reported missing. Casualties are feared in the disaster that struck on the high seas around 9.45 p.m. on Tuesday. The cause of the incident which occurred off the south-west coast of India, is not yet known, the official said. The ICG's Maritime Rescue Coordination Centre (MRCC) Mumbai, received a distress call from the Singapore-flagged 330 m long container ship “Maersk Honam”. The ship had left Singapore on March 1, on way to Suez in Egypt and has a crew of 27, including 13 Indians and the rest of different nationalities. The captain is also an Indian and the remaining crew are Philipino, British, Romanian and Thai. At the time of the distress call, the ship was at a distance of 340 nautical miles from Agatti Isles in Lakshwadeep Islands. The MRCC alerted all merchant ships near the location, through the satellite-based communication network, the International Safety Net (ISN). A merchant navy ship MV Als Cicero, which reached Maersk Honam at about 11.25 p.m., reported that the container vessel was blazing with flames from the main deck of the ship leaping upto the ship's bridge height of about 25 metres. The crew had abandoned the ship as fire spread beyond their control. Mearsk Honam had 27 crew onboard, out of which 23 have been rescued by Als Cicero. The remaining four whose nationality is not clear, are reported missing. Simultaneously, the ICG Shoor, patrolling near Lakshadweep Islands was diverted to assist the distressed vessel. ICGS Shoor is an Offshore patrol vessel with specialised firefighting equipment on board. On Wednesday, the ICG plans to deploy its Dornier D-228 maritime reconnaissance aircraft from Agatti Island for search and rescue. The ICG has diverted four merchant navy ships near the location to assist the distressed ship. At present, the search operation is in progress by merchant vessels Als Cicero, Seaspan Zambezi, Navigator Centauri and Al Jasrah.